Published by George G. Harrap & Co. Ltd., 1931. 1st edition.. Hardback. Very Good. Illustrated by Willebeek Le Mair, Henriette. Very good condition with no wrapper. Large oblong format. Brown cloth spine, brown pictorial boards. Pretty colour plates. Spine and corners bumped and slightly worn. Cover edges very very slightly grubby. Large but light foxspots throughout. One plate was detached, now reinserted but with slightly ragged edges. 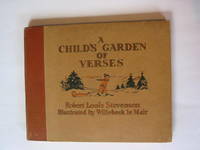 A nice copy of the first edition. Publisher: Published by George G. Harrap & Co. Ltd.